I just implemented a very simple example of serial communication in circle. I used a handshaking algorithm that works with two arduinos. I just added the same algorithm to the third one, plugged them properly, and it worked! The result is that it makes all of the modules synchronize together. The handshaking algorithm is very simple. 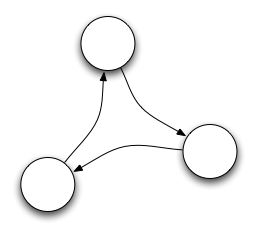 Each node has one sender and one receiver. The board sends a "ping" signal to its receiver. It then waits for a "pong" signal to come back from its sender. 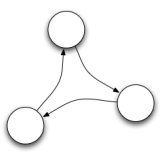 Since each node does the same thing, the objects will eventually synchronize as the messages propagate. IMPORTANT As for I2C communication, in serial communication the grounds have to be connected together. I just implemented a very simple example of serial communication in circle. I used a handshaking algorithm that works with two arduinos. I just added the same algorithm to the third one, plugged them properly, and it worked! The result is that it makes all of the modules synchronize together.The handshaking algorithm is very simple. Each node has one sender and one receiver. The board sends a "ping" signal to its receiver. It then waits for a "pong" signal to come back from its sender. Since each node does the same thing, the objects will eventually synchronize as the messages propagate.